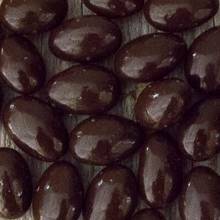 Sugar free crunchy almonds covered in rich and smooth Dark Chocolate. This is the treat you just can't have one of. Price quoted is per pound, not including shipping. Price quoted is per pound, not including shipping. Ingredients: Dark chocolate coating (maltitol, cocoa mass [processed with alkali], cocoa butter, milk fat, soy lecithin, vanilla), almonds, maltitol, tapioca dextrin, tapioca syrup, confectioner's glaze.